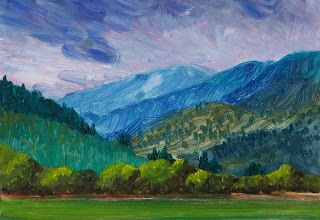 This little 5 x 7 landscape oil painting was created on a gessoed hardboard with a green underpainting. 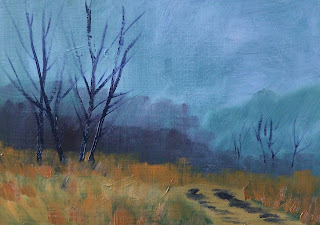 The green of the underpainting helped create the coolness of the winter fog. After the wash, the blue of the fog and the orange and yellow of the grass was added. It was fun to create this little seasonal painting. I like the mysterious atmosphere that developed. This painting is for sale at Etsy this month for $35.00 plus $6.50 for shipping to US addresses. You can click here to purchase it or here to see my other paintings for sale at Etsy. This little 5 x 7 oil painting is one I began working on last spring and finished this summer. It took me a while to complete because it was created using a glazing technique that requires drying time between each layer. Since oil paint can take a week or longer for each layer of paint to dry, glazing is a time consuming endeavor. It begins with a value painting using eight shades of gray. You can see the painting here just before the color glazing began. I allow each color to dry completely before adding the next color. In this case the background received several layers of yellow before adding the blue of the glass. So, even though this painting is small, the effort to create it was large. It is for sale at Etsy this month for $35.00 plus $6.50 for shipping to US addresses. You can purchase it by clicking here. This 5 x 7 landscape oil painting was inspired by the Nature Center at the Nisqually National Wildlife Preserve and the fall colors that surrounded it. Since my visit, the leaves have all dropped from the trees and the afternoon sunshine appears less often. My paintings will probably begin to take on the look of winter as the seasons continue to change. 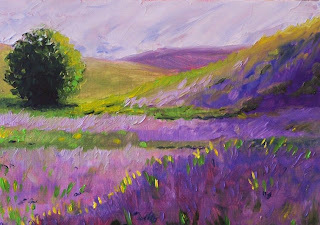 This sunny little lavender field is a 5 x 7 oil painting on gessoed hardboard. I hope you enjoy viewing it as much as I enjoyed painting it. 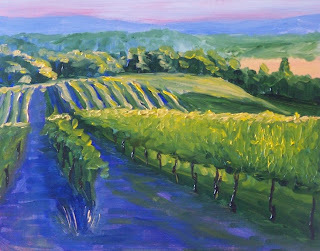 As I painted, I imagined the warm sunshine and the heavenly scent of lavender wafting through the air. It was truly a pleasure. This painting has been SOLD. 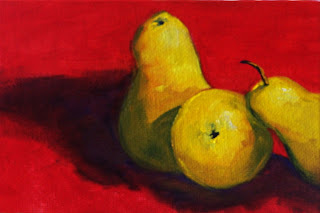 Here is the second of my contemporary colorful pear series. 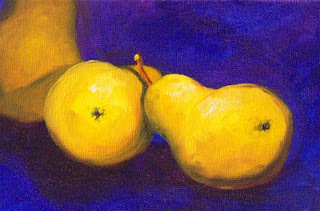 This little oil painting is 4 x 6 on a canvas panel and is a great companion to the pears on blue I posted yesterday. The duo are made especially to brighten a kitchen. Perhaps it can be yours. This painting is SOLD. 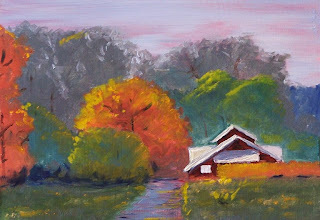 In the mood for bright colors, I painted this little 4 x6 oil painting along with two others. The day was gloomy and cold, so when these pears travelled home from the grocery store, I placed them on a blue cloth and painted the day away. I love bright colors. This little painting is for sale at ETSY for $24.00 plus $6.50 shipping to US addresses. If you click here, you can purchase it through Paypal. It was just a couple of months ago, in the beginning of September, when I painted this 8 x 10 landscape. It was inspired by a walk in a park near my home. The summer foliage was still hanging on the trees and the grass had just begun to turn golden. Now that November has arrived and the trees are bare, I enjoy looking back at that comfortable time of year when I could still walk around without a jacket. This painting is for sale at Etsy this month and you can purchase it for $80.00 plus $12.00 for shipping to US addresses by clicking here. I will mail this painting US priority mail; additional small paintings can be shipped in the same box for no additional charge. Contact me directly at smallimpressions@hotmail.com if there are paintings on this blog you are interested in purchasing. I can quote you a price. Most people who have visited Seattle have seen Mount Rainier. On clear, sunny days locals look for the mountain to "come out," as though it can walk in and out of our lives. It is a familiar vision. If, however, you travel to the southeastern side of the mountain, it takes on a slightly different personality. This painting is based on that alternative view, the one that is seen less often--a view from the other side of the mountain. This painting will be offered at Etsy when the paint dries. In the meantime, you can visit here to see other works that are for sale. 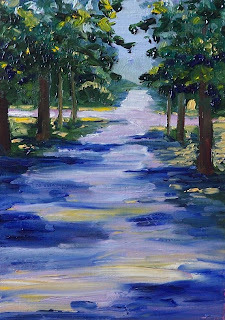 This 5 x 7 oil painting on gessoed hardboard is one of a series of paintings I have done over the past few months of pathways and roads. 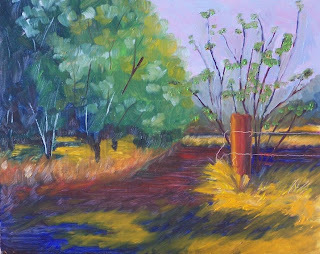 This particular landscape was inspired by a sunny summer walk I took at a county park near Lakewood, Washington State. The park was full of sunlight and a mix of warm yellows and cool greens. I tried to capture my adventure in this bright little painting. It will be for sale this month at Etsy. You can click here to purchase it for $35.00 plus $6.50 shipping to US addresses. If you like this painting or this painting, they are also for sale at Etsy. While the rain beats against my windowpane, I'm thinking about sunshine. 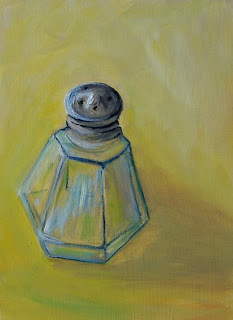 This sunny little 5 x 7 oil painting is the result. It is hard to resist the feeling of warmth when I paint with sunshine in mind. This painting can be purchased for $35.00 plus $6.50 shipping to US addresses if you click here. This week I played with shadows. Among the results is this 5 x 7 oil painting on gessoed hardboard. The cool shadows on a tree-lined pathway were fun to create. 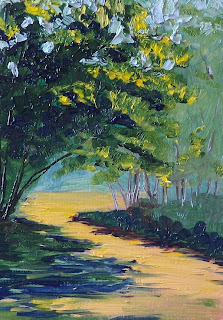 Adding yellow dapples of sunlight helped me think of summer strolls--a delightful memory on a cold, damp winter day. This painting can be purchased here for $35.00 plus $6.50 for US shipping. 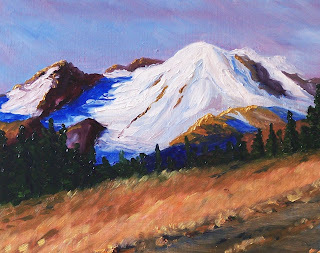 This 5 x 7 oil painting on 1/4-inch gessoed hardboard is another of my series of Puget Sound landscapes. This particular landscape was inspired by the new Chambers Bay Golf Course in University Place, Washington State. It is a brand new Scottish Links course that opened in 2007 with breath-taking views of the sound. It makes a great companion piece to my “Chambers Bay View” painting of the same subject; however, this painting focuses on one of the greens rather than just the view of the bay. This painting as well as the companion painting is for sale at ETSY and can be purchased for $35.00 plus $6.50 shipping to US addresses. Click here to purchase this painting. This 5 x 7 oil painting on 1/4-inch gessoed hardboard is another of my series of Puget Sound landscapes. 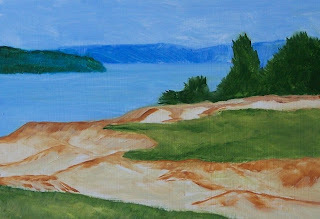 This particular landscape was inspired by the new Chambers Bay Links Golf Course in University Place, Washington State. It is a brand new Scottish Links course that opened in 2007 with breath-taking views of the sound. It was painted using professional grade oil and can be purchased at ETSY for $35.00 plus $6.50 for shipping to US addresses. Just click here to purchase. 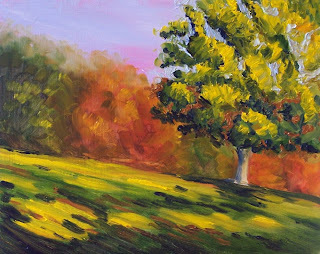 This 8 x10 oil painting celebrates the colors of fall. This past fall was especially colorful here in the Pacific Northwest. Recently I read an article that Vermont was losing its beautiful colors due to global warming and changes in the weather patterns. The beauty of those colors must have moved west, because our autumn colors were wonderful. I woke up to wind and rain. The sparkle of fall was hiding and left me cold and damp. 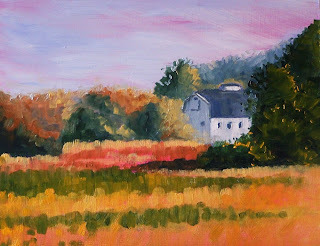 A longing for the warmth of sunshine inspired me to create this sunny little 8 x 10 oil painting. When I finished, I looked out my window to see a beautiful sunny afternoon with a gentle fall breeze asking for forgiveness for its cranky morning behavior. The Cascade Mountains in Washington State stand guard over Puget Sound. It doesn't take very long to travel from Bellingham Bay at the northern end of the sound to the mountains. 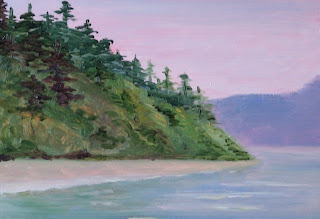 This 5 x 7 oil painting is another of my Puget Sound landscapes. If you visit the Skagit Valley just south of the town of Bellingham on Bellingham Bay in Washington State, you will see similar vistas. 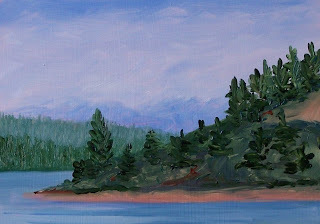 This painting is for sale at Etsy and is a wonderful little companion to the other Puget Sound landscapes I have been offering for sale this month. You can purchase it here for $36.00 plus $6.50 for shipping to US addresses. This 5 x 7 oil painting on 1/4-inch gessoed hardboard is one of a series of Puget Sound landscapes I will sell this month at Etsy. This particular landscape was inspired by a sunrise over Lake Cushman located at the foot of the Olympic Mountains in Washington State. Lake Cushman is all about fishing, camping, and waking up early to see the mist lifting off the lake--the sun glinting off the evergreens of the surrounding hills. This small format oil painting would be great addition to a collection of similar small format landscape paintings. 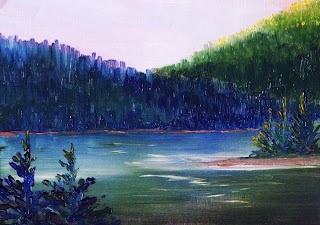 I picture it in a den or an office surrounded by other delightful small paintings that offer respite from daily routine. It would make a great gift for an outdoorsman. I created it using professional grade oil colors. You can purchase it here for $35.00 plus $6.50 shipping to US addresses. This 5 x 7 oil painting on 1/4-inch gessoed hardboard is the second of a series of Puget Sound landscapes that will be sold this month on Etsy. The first painting is here. Anyone who has visited the Puget Sound in Western Washington State will recognize the legions of evergreens that stand guard over the bay. Puget Sound extends from the capital city, Olympia, in the south to Seattle in the north, and finally to the Strait of Juan De Fuca. This particular painting is loosely based on Point Defiance which is located north of the City of Tacoma in Washington State. This painting is SOLD. 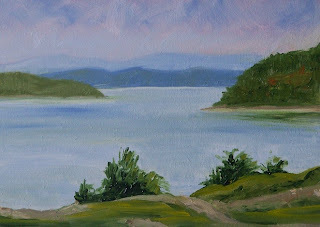 This 5 x 7 oil painting on 1/4-inch gessoed hardboard is one of a series of Puget Sound landscapes that I will be listing this month in my Etsy Shop. Anyone who has visited the Puget Sound in Western Washington State will recognize the legions of evergreens that stand guard over the bay. Puget Sound extends from the capital city, Olympia, in the south, to the Strait of Juan De Fuca in the north. Last March I created this particular painting which is loosely based on Point Fosdick, not too far from the small fishing/tourist town of Gig Harbor in Washington State. You can purchase this painting here for $35.00 plus a $6.50 shipping charge for US addresses. Part of the Nisqually National Wildlife Refuge includes the historic Brown Farm barns. It was delightful to recreate a glimpse of one of the barns. When I visited several weeks ago, it was a wonderful fall morning with sunshine and beautiful autumn color everywhere. The results of my visit is this 8 x 10 oil painting on a gessoed hardboard surface. This is another 8 x 10 oil painting based on my Nisqually Delta experience. A gravel foot path crosses the the fields and scrubby little trees dwell randomly along each side. 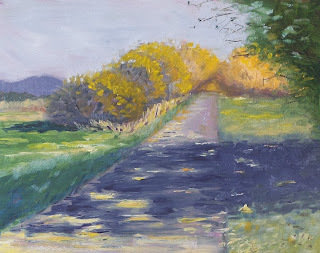 In this painting I was taken in by the shadows that spread across the path in front of me. 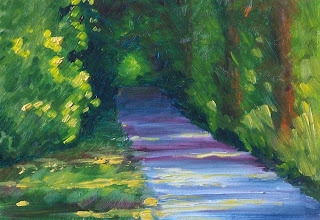 It was fun to try to capture the sparkle of the sunlight on the path as it danced in the breezes.